2 - 3..............Bingo von Ellendonk. 3 - 4..............Jago von Beelen. 3 - 4..............Palma von Ellendonk. 4 - 4..............Satan von Ellendonk. 4 - 4..............Blanka von der Au. 4 - 5,5...........Chico von Forell. 5 - 5,5...........Vello von Fürstenfeld. 1994: 98 points in Protection. 1993: 63-85-96 = 244 points (23rd). 01/09/1996: 94-78-97 = 269 points (6th). 20/04/1991: 81-88-95 = 264 points. 20/03/1994: 100-97-97 = 294 points. 31/03/1992: 84-86-94 = 264 points. Gringo vom Worringer Bruch passed the ZTP with 1A rating for character and SG for conformation and earned the highest protection score (98 points) at the D.V. Meisterschaft in 1994. His sister from a repeat mating, Dunja vom Worringer Bruch, was a participant in the Deutsche Meisterschaft in 1990 and passed the Körung 'for life' with highest possible ratings for hardness and working drives (very high protection, fighting spirit, courage and hardness with middle sharpness). Dunja was also the foundation female for the Warringhof Kennel in Germany and is dam of the von Warringhof “A, B, C, E, G” litters (Alfa, Aischa, Cöbes, Cher, Cocoa). Dunja's litter sister, Diva vom Worringer Bruch, passed the Körung with highest possible ratings for hardness and working drives. 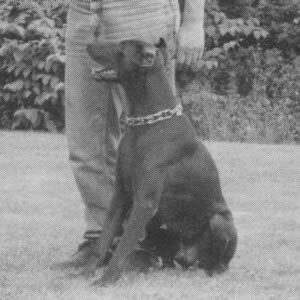 She was also the brood female for the Worringer Bruch Kennel in Nordrhein, Germany and dam of the vom Worringer Bruch “H, J, K, L, M” litters (Hera, Joy).